A visit to Gmail’s Contact section will show a surprise pop-up message, “Your default country for phone numbers in contacts is: Accept or Change default country”. 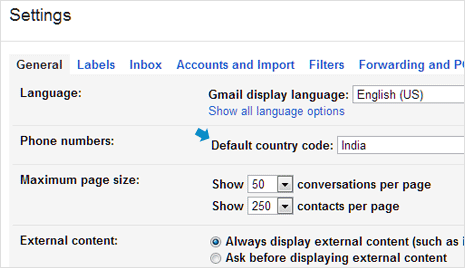 Gmail added a new option to change and set specific default country code for phone numbers in the Gmail Contacts. Once you configure country code settings, phone numbers will be appended with country code of the selected country during new contacts addition. 1. Once you login into Gmail account, click on Gear icon at top right and then click Settings option. On ‘General’ tab of Gmail Settings page, look for Phone Numbers section. 2. Click to select country from drop down box next to ‘Default Country Code’. Once you make country selection, make sure you click Save Changes button at the bottom of the settings page. As seen above, Gmail will also remind you to configure and confirm this setting through pop-up box displayed when you open Contacts section of your Gmail inbox. Ideally, Gmail would have automatically selected your default country setting based on your preferences provided at the time of Gmail account creation. In case you move to a new country, this setting is more than handy to facilitate your location change and new local contacts.